Week ending 12th April 2019. 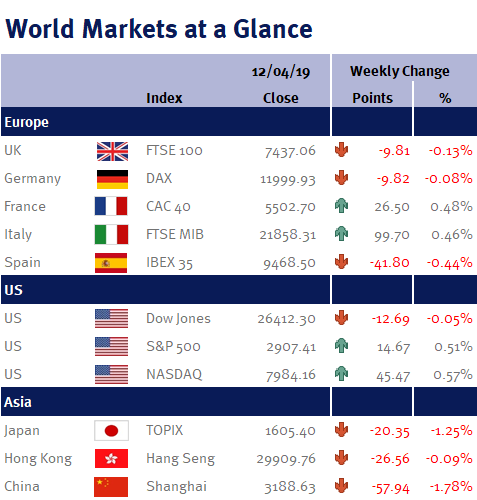 Wednesday (10 April 2019) should have been an important day for financial markets as we had the release of the Fed minutes from its surprisingly dovish March monetary policy meeting; US CPI inflation; an ECB monetary policy meeting; and an EU/Brexit summit. Unfortunately, the day (and the week) was all very bland. Annoyingly, the Fed minutes didn’t actually tell us much more than we already knew: the Fed is likely to keep interest rates unchanged for the rest of the year. There was no indication that the US central bank is currently considering cutting interest rates as they remain positive about the economic and inflationary outlook – i.e. policymakers seem happy to sit on their hands for the time being and just wait and see how the current uncertainties play out. US CPI inflation was slightly softer than expected. While the headline reading climbed by 0.4% to 1.9% (reflecting higher oil prices), the core reading (which excludes volatile items such as food and energy) slowed to 2.0% from 2.1%. Consequently, we believe that inflation is likely to undershoot the Fed’s 2% target – which would suggest that pressure will soon mount on the Fed’s policymakers to start cutting interest rates. As expected, the ECB left eurozone interest rates unchanged and confirmed that they don’t expect to increase interest rates this year. The Brexit drama plays on – this time until Thursday 31 October 2019 after EU leaders agreed to offer an extension. We are not really sure what value this extension provides – we have long argued that pushing out our departure date simply prolongs the uncertainty. And an extension to the end of October only takes the pressure off the cross party/Tory-Labour talks (which don’t appear to be going anywhere) – it probably isn’t long enough for the Conservatives to change their leader and then call a general election, or hold a second referendum. Despite the Brexit uncertainty (or because of it), the UK economy grew by 0.2% in February (GDP data suggests that some companies brought forward orders and stockpiled ahead of our original Friday 29 March 2019 Brexit date). Elsewhere, the International Monetary Fund (IMF) cut its outlook for global growth. However, the downgrades aren’t a surprise given the recent soggy data readings. Additionally, the IMF isn’t forecasting a recession – just a slight slowdown. The IMF now expects the world economy will grow by 3.3% this year, down from the 3.5% forecast the IMF made in January for 2019. The US is expected to grow by 2.3% (down 0.2% from its outlook in January, predominantly due to January’s partial government shutdown) – however, the IMF upgraded its US forecast for 2020 by 0.1% to 1.9% due to the Fed’s recent U-turn and dovish shift on interest rates. The 2019 outlook for the eurozone was cut to 1.3% and the UK to 1.2% (both down 0.3%). Looking ahead to next week, in the UK we have employment data (unemployment rate and weekly earnings); CPI; and retail sales. Additionally we have US retail sales; the Fed’s Beige Book; eurozone CPI; eurozone PMI; and Chinese GDP.